Specifically developed for men, the Rituals Samurai Anti-Ageing Face Cream delivers hydrating and revitalising properties without greasy or sticky residue. 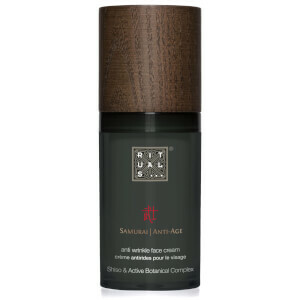 Inspired by ancient Samurai warriors, the lightweight, fast-absorbing cream synergises Japanese Shiso and an Active Botanical Complex to deliver intense moisture, whilst fighting the appearance of fine lines and wrinkles. Protects and refines skin to leave it looking smooth, youthful and well-groomed. Apply to the whole face, morning and night. Aqua/Water, Glycerin, Vitis Vinifera (Grape) Seed Oil, Cetearyl Alcohol, Cetyl Palmitate, Pentylene Glycol, Cocoglycerides, Neopentyl Glycol Diheptanoate, Prunus Persica (Peach) Kernel Oil, Methyl Methacrylate Crosspolymer, Panthenol, Dipalmitoyl Hydroxyproline, Pentaerythrityl Distearate, Simmondsia Chinensis (Jojoba) Seed Oil, Perilla Frutescens (Shiso) Seed Extract, Camellia Sinensis Leaf Extract, Sodium Hyaluronate, Dimethicone, Cetearyl Glucoside, Butylene Glycol, Hydroxyethyl Acrylate/Sodium Acryloyldimethyltaurate Copolymer, Sodium Stearoyl Glutamate, Tocopheryl Acetate, Lecithin, Tocopherol, Ascorbyl Palmitate, Pentaerythrityl Tetra-Di-T-Butyl Hydroxyhydrocinnamate, Glyceryl Stearate, Carbomer, Coco-Glucoside, Glyceryl Oleate, Pantolactone, Palmitoyl Oligopeptide, Citric Acid, Sodium Hydroxide, Ethylhexylglycerin, Phenoxyethanol, Eugenol, Linalool, Limonene, Geraniol, Citral, Butylphenyl Methylpropional, Citronellol, Coumarin, Alpha-Isomethyl Ionone, Parfum/Fragrance.